Each year, thousands of people take part in the various races falling under the umbrella of the Vienna marathon. And those of us with a little less energy get to watch. Now in its 37th year, the Vienna marathon attracts runners from all over the world, including top-class athletes with Olympic experience. The Stadtpark and around the Ring boulevard to, for example, the Kunsthistorisches Museum, Naturhistorisches Museum, Hofburg Palace, Rathaus (and finish line), etc. Think of it as a sightseeing bus tour without the bus. 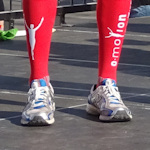 The 2019 event saw a new Austrian marathon record for men set by Lemawork Ketema, who completed the course in 2 hours, 10 minutes and 44 seconds. Kenya’s Vincent Kipchumba won the race. Nancy Kiprop set a new women’s record for the course of 2 hours, 22 minutes and 12 seconds. For full details on competing, routes, locations, etc., see the official website. The marathon race weekend is April 18th and 19th, 2020, with the expo and registration desk likely open on the 17th and 18th (details to come). The main race, half-marathon and relay marathon take place on the Sunday, beginning at 9 am. The marathon proper usually “ends” at 3 pm, after which the entire course is reopened to normal traffic. The organisers provide a nice little overview of where and when to see the runners, complete with suggestions on how to get to the viewing spots. Look under Race Info / Fans at the website. They also have a map showing entertainment spots along the route.